BBQ. Sesklia Island with Wendy, Stephen, Guido and Anna. Steve and I had a perfect two weeks in Greece for all the usual reasons one loves vacation: we lived a life different than the one we live in. We ate out for every meal; we had a different adventure every day; we saw breathtaking landscapes on an hour to hour basis; and we connected with strangers simply because they were away from home at the same time we were. Sometimes the connection is so easy and familiar, you end up feeling as if you’d been friends with these strangers all of your life. On the day we refer to as “The Poseidon Adventure”, Steve and I sat down at a picnic table with Wendy and Stephen from England and Guido and Anna from Italy. We drank wine and ate home cooked barbecue and watched the goats and embarked on a lively discussion of the Donald Disaster. These Europeans, as well as every other person we spoke to Greece, were shocked so many Americans find him appealing. After lunch we reboarded the boat for more swimming in the perfect water around the island and at the end of the day email addresses were exchanged. This led to a flurry of emails between Wendy and me on the virtues of Symi. I asked her if she would write a blog for WS50 and she graciously agreed. Our experiences in Symi were different but our feelings were identical: pure love for this magical speck in the Aegean Sea. This is Wendy’s adventures in Symi. Don’t get me wrong, we love our lives in the United Kingdom, but as busy people with multiple occupations, (I am a budding stained glass artist and foster carer, caring, until recently for three teenagers; Stephen is a mooring hand at the port of Dover and a plumber and heating engineer), we value our time alone and Symi is the ideal place to relish that time. Back in 2006, when my husband Stephen and I travelled on a package tour to Symi, the journey to our honeymoon island was relatively stress free. 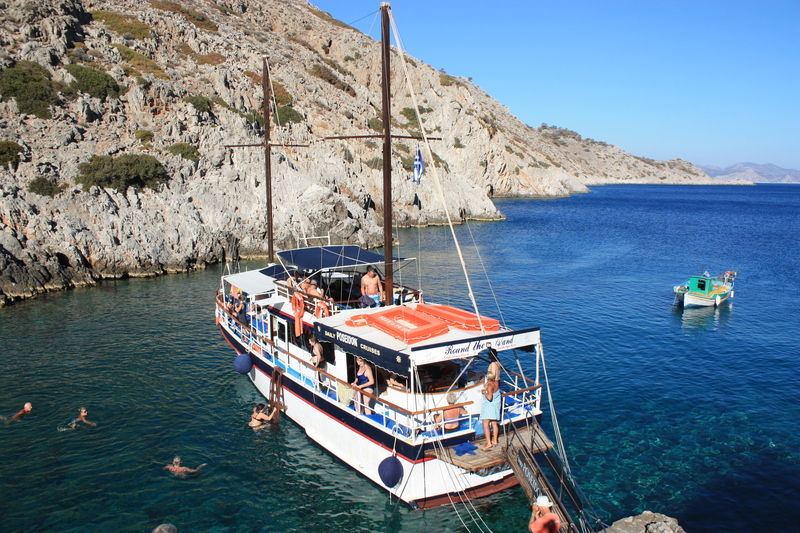 The easiest route from the UK to the island is by air from London Gatwick airport to Rhodes and then a 90-minute ferry to Symi. On a package tour the worries of transport between airport and port and any difficulties with transport or accommodation are borne by someone else and this is often enticing. 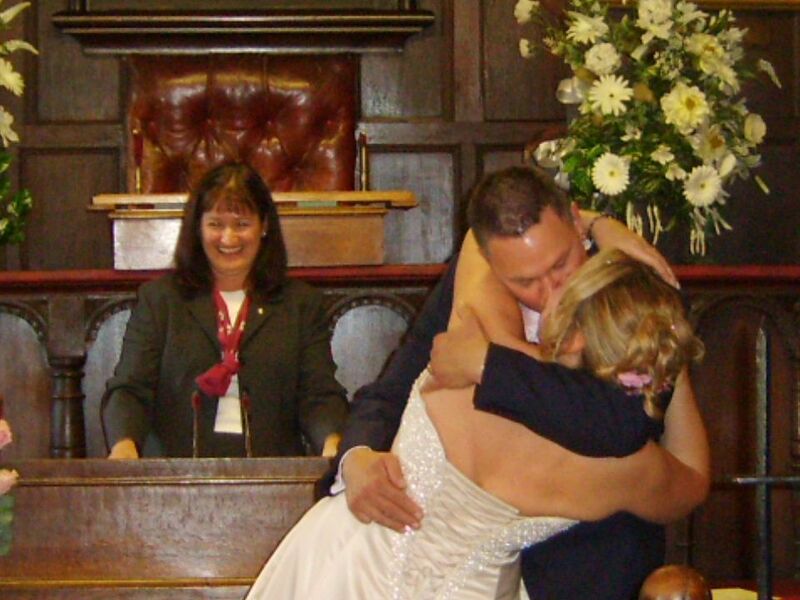 However, on this occasion we took the plunge and travelled independently. We are not entirely new to this, having travelled independently extensively throughout Europe and having visited China, Thailand, and the Maldives in recent years. So this year we booked our own flights, arranged ferry tickets and accommodation on Symi and the trip there was fairly lengthy for a trip within Europe. We flew from London Gatwick airport at 9am and arrived in our Symi penthouse (sic) around 10 hours later, tired from the trip, exhausted by the slog up the steps and hills to our apartment but absolutely elated by the night time view of Yialos (the harbour) from the dizzy heights of Chorio (the village). The next morning we awoke to the reality of Greek accommodation, which is basic to say the least. In the haze of the last ten years we had forgotten about the “no flushing of toilet paper down the loo” rule and the bucket in the shower to water the plants (water being a precious commodity) and the concrete hard bed. However, all that faded when we flung back the blinds and the full beauty of this striking island hit us right between the eyes and we found ourselves in possibly the most stunning place in Greece…..again! 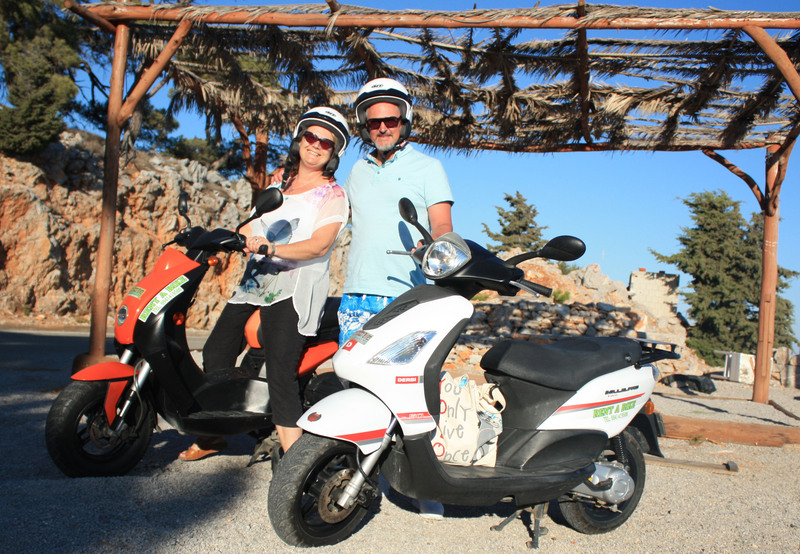 Hire a moped – if you have never ridden one, even better. 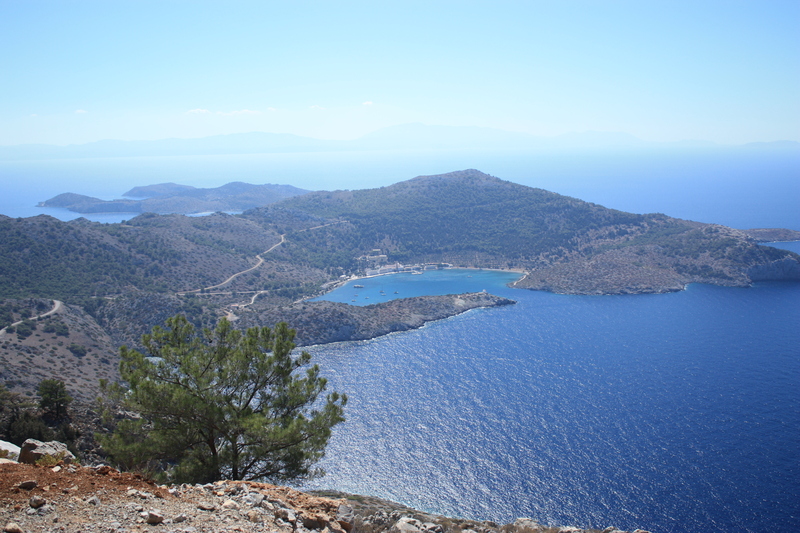 Riding across the island from Yialos, where you may hire one, to Panormitis which is a monastery at the farthest side of the island is an absolute must-do. The hair-pin bends and sheer drops with no railings are a cheaper, longer and far more thrilling ride than any fairground can provide. 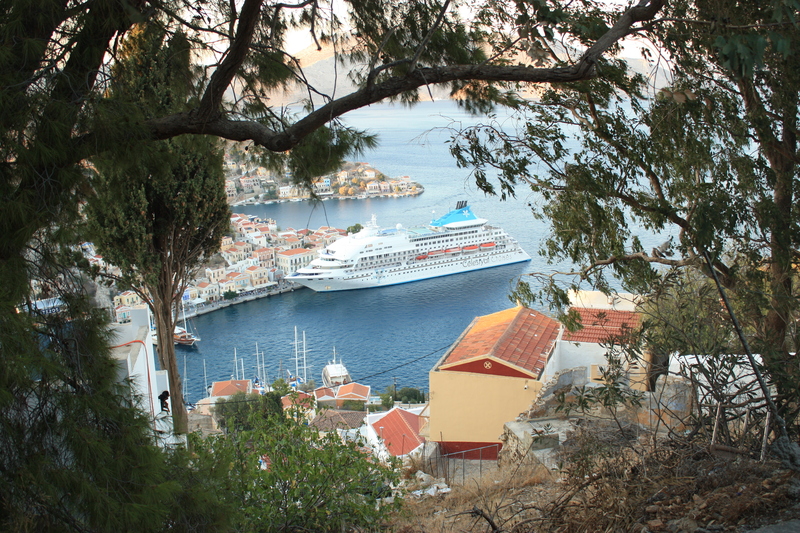 For a more `genuine’ Symi experience stay in Chorio, rather than the more touristic Yialos. If you can get past the desire for fluffy towels and turned down bedding in the evening, then living in a `down’ apartment i.e. the room at the bottom of a large Symi village house, then you will experience more of what it is like to live like a local. That said, anyone with mobility difficulties will struggle living in the village with the many hills and steps. Take a boat trip around the island early in your trip – you will then see all of the beautiful little coves and beaches and select those that draw you most, to revisit. When selecting your beach do try to visit one with resident goats. No Symi experience is complete until you have grappled with a goat which insists on eating the contents of your beach bag. Take bets on who wins the battle, amongst your fellow beach dwellers, just to increase the fun. Ride the bus – if you didn’t get enough of a thrill from the moped ride, then the bus will finish you off. On more than one occasion I was working out my exit from a window in the bus, should we actually topple into the harbour. Truly, the width of the road around the harbour barely fits a moped, let alone a bus. Climb as high as you can, as high as your lungs will carry you, up the Kalli Strata to see the epic views of Chorio, Yialos and Pedi beach. You will not regret it. If you are lucky you will pass Dead Goat Alley, although hopefully the goat will be a thing of the past by then. Eat, eat, eat, then eat some more. The food on Symi is a wonder to behold. It is mainly simple and mainly locally caught but it is also mainly fresh and mainly plentiful. It is difficult to recommend a good restaurant because we didn’t manage to find a poor one. 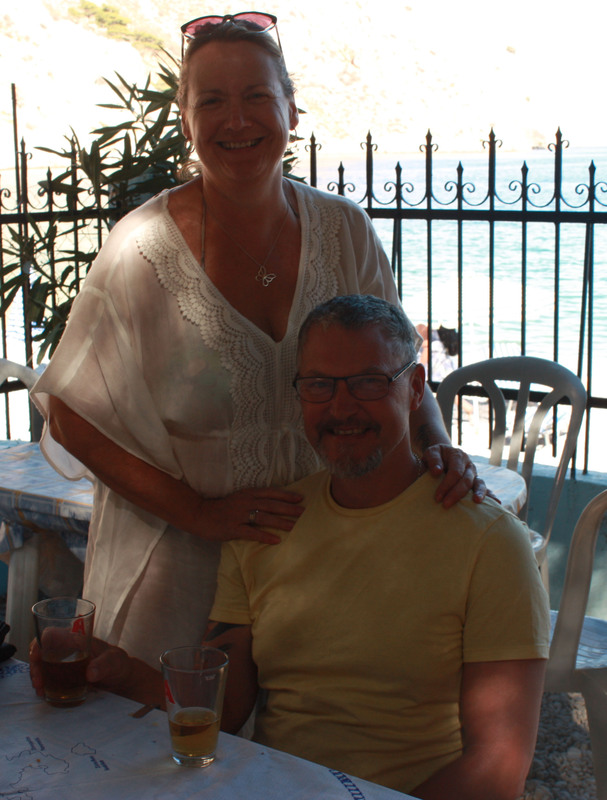 From the `posh’ restaurants in the harbour, designed to draw the wealthier yachting clientele, to the takeaway kebab shop on the Kalli Strata in Chorio, we ate like Kings and Queens. 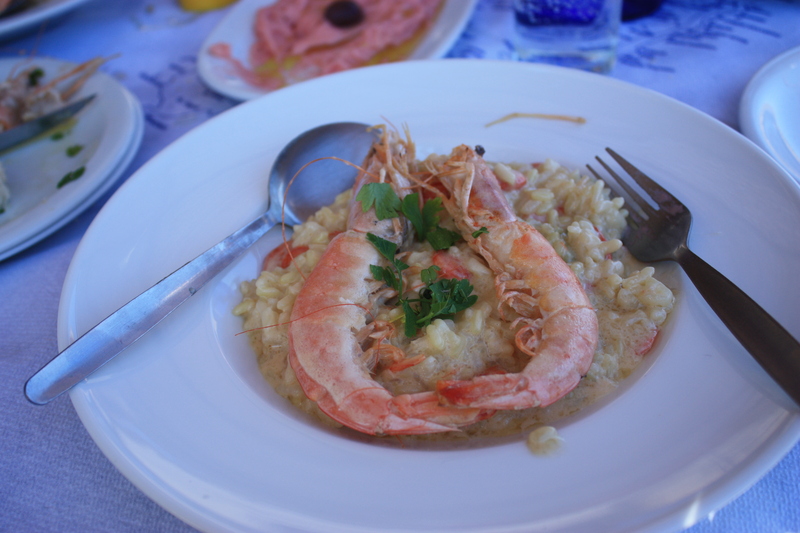 We had the most stunning prawn risotto on the beach at Marathounda beach, an amazing Moussaka at Zoe’s Taverna, mouth-watering casseroled calamari and melt in the mouth lamb at the Windmill restaurant in Chorio (well worth a second visit), where we spent our 10th anniversary evening. 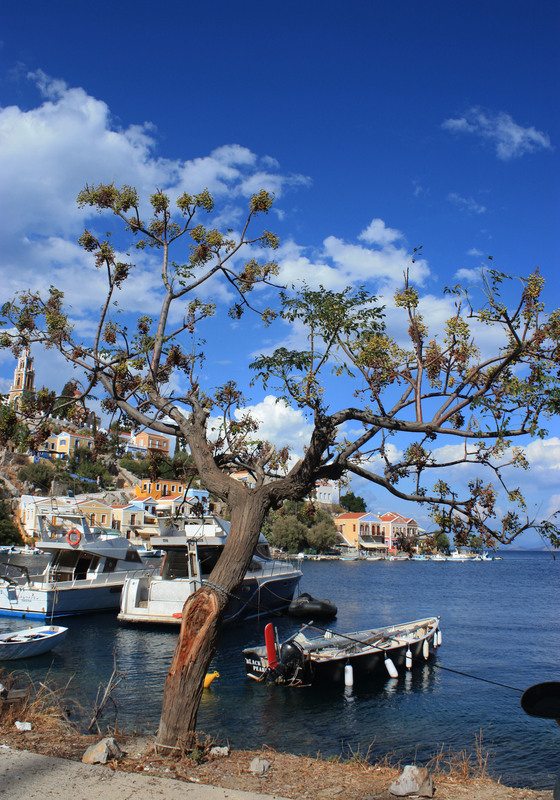 So, our ten-year-old and rose tinted view of Symi remains intact after our return visit. The island has hardly changed in that time and for that it is precious indeed. Will we return? We spoke to lots of people who return year on year and sometimes several times a year. We aren’t ruling out a return visit, but the world is such a big place and we are adding places to our bucket list faster than we are crossing them off so….. watch this space….. perhaps we will celebrate our 20th anniversary there. Next time we may need to stay in Yialos, far fewer steps! What started it all 10 years ago.